Giving your body what it needs before exercise is an essential component to maximize any workout. To achieve optimal results it is beneficial to know the appropriate balance between carbohydrates and protein, specific to both your individual needs and the demands of the workout. Pre-workout nutrition provides your body with a source of energy, a reduced risk of injury and the appropriate type of fuel for your workout. From yoga to power lifting, the metabolic demands vary so your pre-workout fuel choice should match your exercise. A 30-minute yoga session may only require half of a granola bar prior, while running 90 minutes may require 1.5-2 of the same granola bar. Meeting with a sports dietitian will help you learn what fuel choices are optimal for your exercise regime! Fall is here and so are these fall superfoods. Packed with vitamins and health benefits these foods are a great addition to any diet. Unlike white potatoes, sweet potatoes are very nutritionally dense. They are a great source of iron and potassium, which help support the immune system and lower blood pressure. Sweet potatoes also offer anti-inflammatory benefits. Brussel sprouts get a bad wrap for tasting bad, but cooked correctly they can be very tasty. Brussel sprouts are extremely high in vitamin K. Vitamin K is most known for its role in blood clotting, but also promotes strong bones growth and helps prevent heart disease. Brussel sprouts also provide cholesterol-lowering benefits. Parsnips share characteristics to carrots but are much sweeter. They are an excellent source of fiber which prevents constipation and lower cholesterol levels. Parsnips are also rich in potassium and vitamin C.
One of the great things about cauliflower is there are so many ways to enjoy it, steamed, baked, mashed and the list continues. Beyond this cauliflower has compounds that have been linked to preventing cancer and are an excellent source of vitamin C.
Pomegranates have been a hot topic the past few years because of their many benefits. They have potent anti-inflammatory benefits and lower blood pressure. They have three times more as many antioxidants as green tea and even have been linked to help combat prostate cancer and diabetes. Benefits and Drawbacks of a "Cheat Day"
Professional athletes and Olympians are so focused on their nutritional needs and macronutrient balances that many believe they can't slip up and take a "cheat day" of eating whatever they like. But some health and fitness experts think that relaxing the rules temporarily can yield more benefits than sticking to a rigid plan. So, who's right? You're eating healthy, getting plenty of physical activity, and yet your performance isn't improving the way you want, or you just feel stalled. This is the dreaded plateau. Being completely restrictive in your diet, can lead to deficits in certain nutrients and calories. Though binging on pizza and cake is not the answer, allowing yourself some freedom in your diet can help physically and mentally. For some people, a cheat day is seen more as a goal than a reset. You might look forward to it in the same way that you do a holiday or a vacation—as a reward that lets you step away from the drudgery of work. With this perspective, however, cheat days can turn into a binge. Convinced that you have to eat everything you want in one day, you might rack up thousands of empty calories, and that can take days to balance out. In fact, you might not be back on track before your next cheat day, which means you'll constantly be pushing yourself backward. In general, what makes a cheat day successful or defeating is how you approach it. If you see it as a way to reset your metabolism, it may be helpful (and tasty). But if you view a cheat day as a reward for your hard work, then it's more likely to turn into a cheat week, cheat month, or cheat year. Overall, it is important to think about food as a fuel. We need all food groups and a team of nutrients to help us feel well. The medical information on this site is provided as an information resource only, and is not to be used or relied on for diagnostic or treatment purposes. This information should not be used as a substitute for professional diagnosis and treatment. Please consult your health care provider, or contact Viverant for an appointment before making any healthcare decisions or for guidance about a specific medical condition. Viverant shall have no liability, for any damages, loss, injury, or liability whatsoever suffered as a result of your reliance on the information contained in this site. In some sports, like wrestling and boxing, fasting is used as a way to drop weight quickly in order to make a certain weight class or to provide an advantage during a match. Intermittent fasting has become a hot topic in the sports and fitness world, since some athletes have reported stronger results by skipping meals in a strategic way. Some plans call for a 24 hour fast and others just skip a single meal. Elite athletes are highly in tune with their bodies, and understand the effects of every tweak and change, from drinking an extra glass of water per day to fasting for 18 hours instead of 12. Those who believe in intermittent fasting claim it helps burn fat while preserving lean muscle and helps flush the body of toxins. One of the major reasons some athletes use intermittent fasting is it teaches the mind about hunger. There is internal and external hunger. Internal hunger are real symptoms your body uses to show you need food, such as light headedness. External hunger is what causes us to eat based on our emotions, like sadness and boredom. Intermittent fasting makes athletes take a deeper look to find out if they are truly hungry or if there are just external hunger cues. It is important to know almost all of intermittent fasting results are based solely on testimonials and not research. Though athletes will lose fat, some research shows the loss of lean muscle while fasting as well. The argument for fasting to flush toxins also has flaws. The liver and intestines responsible for detoxification need calories to do their job. Therefore fasting could slow down this process or even bring it to a halt. In response to internal and external hunger, although it is important to not eat based on your emotions, fasting and ignoring hunger can lead to binge eating. Working with a nutritional counselor is the best way to be sure you are eating correctly for your activity level. Though there are many new and trendy diets out there, not all of them are right for everyone. Athletes often concentrate on eating to fuel their performance in specific ways. For example, Olympians are extremely strict about the quantity and timing of their meals. But it's just as important to consider how food can help anyone—even weekend athletes—prevent injury and recover faster from strenuous exercise. The key is incorporating more antioxidants into the mix. These help protect the body from problem-causing molecules called free radicals. You're exposed to these through everyday pollutants, and the breakdown of certain medications, but they're also produced as part of the body's normal process. When your body is acting efficiently, these free radicals get flushed away, but sometimes they linger and end up causing cell damage. Antioxidants stabilize free radicals, and render them harmless. Berries: If you're going to go with one fruit, make it a dark berry like blueberries or blackberries. The key phytochemicals they contain can not only prevent cell damage, but studies have shown that they lower inflammation, which is crucial for injury prevention and recovery. Prunes: Although they have a reputation more as a digestive aid (which is also a big benefit), prunes are very high in antioxidants. In fact, they have twice the amount as black plums, from which they're derived. Oranges: Dark-skinned fruits get the most attention for their antioxidants, but oranges also pack an impressive amount as well. Along with peaches, mangoes, and watermelon, they also boast beta-crytoxanthin, which has been shown in some studies to lower the risk of arthritis. Dark greens: All hail the kale. Leafy greens are rich in antioxidants and vitamins, so load up on options like spinach, kale, collards, and Swiss chard. All of these are also great for lowering inflammation, and putting more dietary fiber into your meals. Omega-3s are the go to fat for reducing inflammation. Reducing the inflammation around an injured area will help reduce pain and promote healing. Some studies have even shown that with the correct amount of omega-3s pain killers and drugs a like may not be necessary. Examples: salmon, flax seeds, and walnuts. Probiotics are the healthy bacteria that reside in your stomach. They help with digestion and extremely important to athletes. Probiotics increase antioxidant absorption which helps speed up recovery. Not only that, probiotics also boost the immune system. Examples: yogurt, kefir, sauerkraut, kimchi, kombucha, miso, tempeh. In general, eating more vegetables and fruits, along with healthy fats and lean protein,can keep your immune system stronger, minimize muscle aches, and get you bouncing back faster from even a boot camp workout. Pre-season practices equal hot long days. 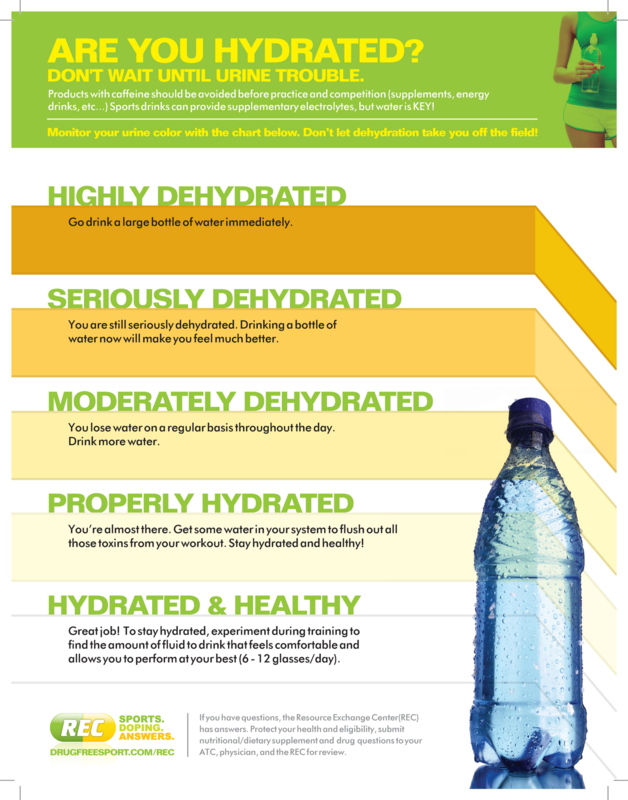 Hydration is one of the main priorities for athletes during summer practices. With the heat comes increased sweating rate and dehydration. 1 to 2 percent of body weight lost in sweat causes mild dehydration and more than 2 percent body weight lost can be life threatening. Heat stroke and heat exhaustion are serious issues that affect high school and collegiate athletes every year. The Institute of Medicine says athletes should drink a minimum of 3.7 liters of fluids throughout the day to prevent dehydration. Being well educated on hydration is essential to perform at an optimal level during two-day practices through the hot summer heat. Before a long practice athletes should drink about 16-24 ounces of water, 2-3 hours prior. During practice athletes should be drinking at least 8 ounces of fluids every 20 minutes. Athletes that sweat heavily should drink 10 or more ounces to ensure proper electrolyte replacement. After, athletes should drink at minimum 64 ounces of fluids. It is recommended athletes drink closer to 96 ounces to ensure complete rehydration. A great way determine the correct amount of fluids to refuel is weighing in before and after practices. Athletes should drink in-between16-24 ounces of fluid for every pound they lost. It is important to understand that when you feel thirsty you are already mildly dehydrated. Stick to a hydration plan and do not decide how much you should drink based on thirst level. Monitoring urine color is also important in ensuring you are fully hydrated and ready for a strenuous training session. What's It Like To Eat Like an Olympian? Check out these 3 surprising facts about how top athletes fuel performance—and why you may want to think twice about copying their strategies. Ideally, meals will be a balance of the macronutrients of protein, carbohydrates, and fats—but what the ratios will be can differ significantly, given a wide variety of factors like activity level, age, and weight loss or gain goals. Athletes, in particular, can find performance gains by focusing on ratios for certain types of sports, which usually fall into the categories of strength and endurance. Let's break down the differences. When embarking on sports or activities that rely on endurance—which can be anything from running to basketball to swimming—you'll likely be burning calories at a nice pace, which means it's important to refuel with more carbohydrates than protein. Many studies have found that carbs can improve endurance capacity and help speed up recovery. But that doesn't mean you should load up on refined carbs like white bread and other processed foods. It's much better to get carbs from healthier sources like fruits, vegetables, whole grains, and legumes such as beans. If you have a sport that's more about strength—such as weightlifting, wrestling, and power yoga—then you'll likely get better performance by focusing on protein instead of carbs. While you'll need both to some degree, protein has been proven to build and maintain muscle. Much like carbs, you'll want to focus on high-quality sources such as lean meats, fish, eggs and low fat dairy. For both strength and endurance, incorporating healthy fats is essential—consider options like nuts, avocados, and olive oil. These not only help you feel full for longer, but they also stabilize blood sugar levels, and can "unlock" some types of vitamins from your food. When creating meal plans based on these factors, it can be especially helpful to bring in some expert insight. Consider tapping into a sports performance nutrition program that's designed to give you individualized nutrition plans to meet your goals. Are You Fueling Your Body For Running? To maximize long distance running results, nutrition must become a major part in your training regime. Treating your long runs as trial races is a great way to see what works for you and what you should eat on race day. What, when and how much to eat is different for everyone, but there are some guidelines you can follow to find what works best for you. There is nothing worse than having an uneasy stomach only a few miles into a race, which is why it is important to train your whole body including your stomach. Foods high in fiber can often cause gastrointestinal stress, which often leads to an upset stomach, gas and bloating. High fiber foods also take up more water, causing you to feel heavy and slow. Fiber is an important part of your daily nutrition, but if you are sensitive to fiber, try eating fibrous foods later in the day. Fatty foods can often make you feel sluggish. It might be obvious to avoid fast foods, but other healthy fatty foods, such as nuts and avocados should also be avoided a couple hours before a long run. Fat takes longer to digest and convert to energy. Carbohydrates are great before a long run. Both whole grain and refined carbs have their benefits, but it is important to find a balance. Refined carbs have less fiber than whole grains, and therefore are more easily broken down and quickly turned into the energy you need to tackle a long run. However, refined carbs have less nutritional benefits and should be eaten in moderation. Fruits and vegetables that are low in fiber also help boost your running game. Low fiber fruits and vegetables such as tomatoes, cantaloupe and zucchinis are easily digestible and will not weigh you down. Electrolytes, though not a food, are important before a long run. Endurance athletes lose a significant amount of electrolytes in their sweat, and without the proper replacement it leads to muscle cramping. For the casual runner who runs less than one hour, eating a well rounded diet with nutrient rich foods and proper hydration will most likely give them the amount of electrolytes they need. However, when heading out on a long run sodium-enhanced sports drinks can be helpful to keep electrolytes as well as carbs at an optimal level. 3-4 hours before a long run: A meal including pasta or rice with a low-fat sauce, baked beans on toast, or a baked potato with cottage cheese and milk. 1-2 hours before a long run: Snacks could include foods such as cereal with milk, fruit flavored yogurt, or liquid meal supplement. Most athletes are able to consume carbohydrates within the hour before a run, but for some, their blood glucose levels drop due to the increase of insulin. It’s important to remember everybody’s system works a little differently so it is best to experiment with foods and time consumed before a big event like a marathon and find a routine that works. For help developing a nutrition plan that is right for you, contact Viverant to optimize your training. Do You Need More Carbs? Within the last decade, low-carb eating has picked up a great deal of momentum. Evolving from diet campaigns like South Beach and Atkins, the strategy is now employed by people following plans like Paleo and Whole30. Some people are even attempting to do "zero carb," putting their bodies in a state called ketosis that's designed to burn more fat. Despite their current reputation, however, carbs are not an enemy. As part of one of the three macronutrients the body requires, carbohydrates play a key role in nutrition. They're a main source of fuel, crucial for organ function (including the brain), and essential for digestive health. You have no energy: If you're dragging yourself out of bed in the morning (hey, why else would your clock even have a snooze setting? ), and then fueling with caffeine to jolt yourself through the day, your carb amount may be off. There can be many factors for energy imbalances, but since carbs are the body's fuel tank, you need to make sure you've putting in enough gas to get you through the day. Your fitness is suffering: In addition to providing consistent energy during the day, carbs are particularly essential during more intense activities like running or strength training. Digestion has hit a roadblock: Many people on low-carb or zero-carb diets have to supplement their eating with additional fiber, to address constipation. But even that strategy doesn't always work. Often, they have to introduce additional starches or increase carbs to get back to regularity. Wondering about how carbs should be incorporated into your overall nutrition plan, especially as your goals change? Talk with one of our nutritional counselors to find the balance that's right for you.